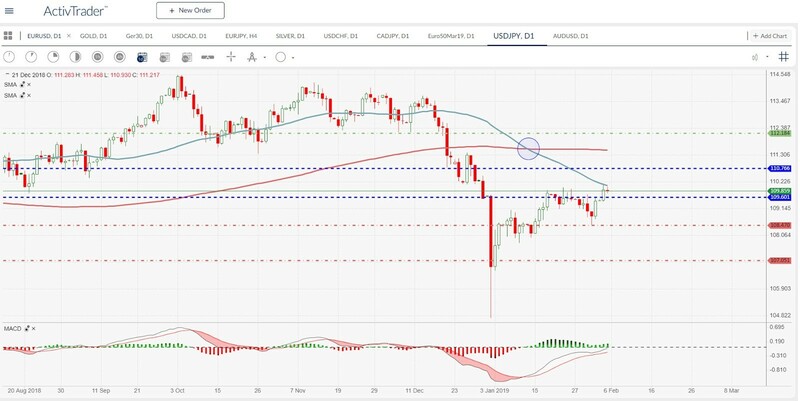 USD/JPY: Is there life after the Death Cross? Today there is important economic data coming from the USA. The ISM releases the Non-Manufacturing PMI by 3 p.m. GMT. That is midnight in Tokyo, Japan but the currency markets never sleep. So, it’s timely to look at the Japanese yen against the US dollar. In mid-January, the daily chart formed a “Death Cross” (where there was a cross between the MA 50 and the 200-day line). For many analysts, the so-called Death Cross is an ominous harbinger of a crash, but it can also provide many false signals. So far there is no talk of falling prices. At the beginning of the week, the market was able to form a new short-term high of 110.16. With this high, the market also found resistance at the 50-day line. In the short term, however, the USD/JPY does not look quite so bad, especially after Monday’s new high. Currently, the pair has risen above the 50% Fibonacci Retracement level in the 109.60 regions. However, a sustained break above the 50-day line, which presently serves as resistance, is a prerequisite for further gains. Further resistance on the way up is at the 61.8% Fibo retracement in the 110.76 range and then at the 200-day line (currently in the 111.50 range). If all these levels are breached, the market could head for the lower barrier of the old sideways movement in the 112.18 range. If the market bounces off the 50-day line and even falls below the 50% Fibo retracement at 109.60, then the next support is in the range of 108.47. If the bears then continue to dominate and the market also falls through this support, there is a structural level in the 107.05 area which can serve as support.